Las Vegas - the Strip or Las Vegas Boulevard. When we talk about Las Vegas and the street where all the known hotels and casinos are we talk about the Strip. It is an approximately 7 km long part of the street - Las Vegas Boulevard South. Tip! As The Strip is not very long, we think that a good way to see the whole bit is to take a day and just walk along the street and go in to the hotel / casinos you want. You get a good overview of everything. In the south it starts at Mandalay Bay and Luxor and in the northen end the street ends with the hotel Stratosphere. And in between lies the rest of the famous Las Vegas casinos. 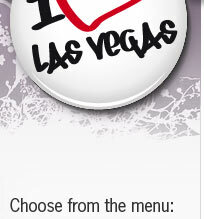 Further south on The Strip, you'll find Las Vegas airport - McCarran Airport (LAS). If you arrive by car you will be met by Las Vegas's most famous sign - Welcome to Fabulous Las Vegas - from 1959. 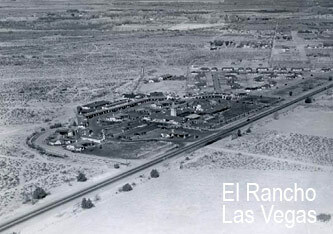 The first hotel built in what is now known as the Strip was "El Rancho Vegas". It opened 3 april 1941 and offered 63 rooms. The hotel was here until 1960 when it was destroyed by a fire. 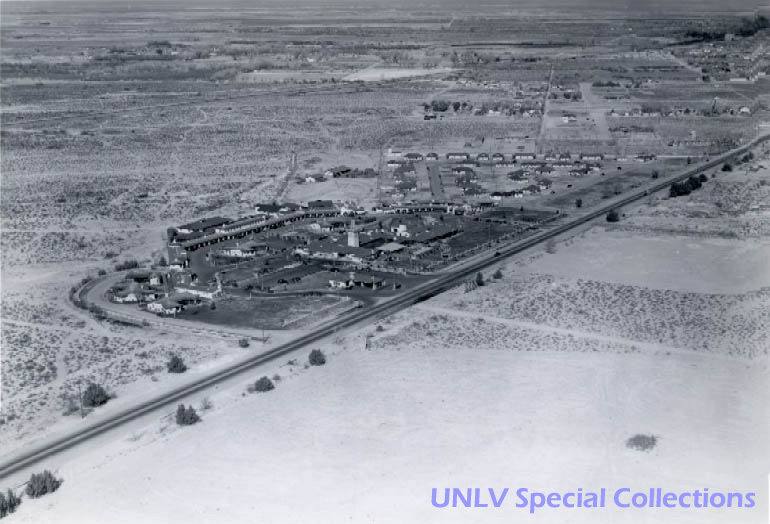 As the hotel was a success, this resulted in an additional hotels which opened 1942 as Hotel Last Frontier. The most famous hotel and casino, which is still there today (2008) is, The Flamingo which opened its doors 26 december 1946. Flamingo has over the years undergone several rebuildings to become the giant hotel it is today. The first real Mega-hotel on the Strip was the International Hotel, which opened in 1969 with as much as 1,512 rooms. This was then the world's largest hotel. It was now the era of Mega-hotels started. Today is the International Hotel known as the Las Vegas Hilton. 1989 opened the Mirage, which then set a new standard for hotel experiences in Las Vegas, with all that entertainment had to offer, restaurants, casino and hotel rooms. The smaller older hotels, was then shut down and left to history such as: the Dunes (1955-1993), the Sands (1952-1996) and Stardust (1958-2006). Today, you find instead major new Mega-hotels on their old sites. Stardust disappeared in "a Big Bang" on Tuesday, 13 March 2007. When you talk about where a hotel is located on the Strip you often mention on which side of the street it is - West side or East Side. Four Seasons Hotel Las Vegas, Mandalay Bay, Luxor, Excalibur, New York-New York, Monte Carlo, Bellagio, Caesars Palace, The Mirage, Treasure Island, Echelon Place, Slots-A-Fun, Circus Circus and Stratosphere. Tropicana, MGM Grand, Planet Hollywood, Paris Las Vegas, Bally's, Bill's, Flamingo, O'Sheas, Imperial Palace, Harrah's, Casino Royale, The Venetian, The Palazzo, Wynn, Riviera and Sahara. 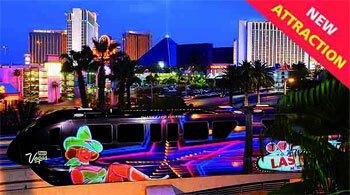 Along the Strip you´ll find the Las Vegas Monorail. A train raised above the ground, which will take you between many different hotels. There may be a little hard to find the Monorail stations as they are not located exactly on the Strip, but more behind the hotels. We got a bit lost when we tried to find the station at the Paris hotel. We thought we easily could walk through the hotel, but as we have learned now, every hotel is veeery.... large and it is difficult to find your way inside the hotels. But we got help from a friendly guide inside the hotel that showed us the way out again:).